Has SeaWorld finally turned a corner? Attendance was up nearly 15% last quarter, helping the company report better-than-expected sales. Shares of SeaWorld (SEAS) surged 10% on the news and it's now up 30% this year. It's important to note though that the first quarter is typically a slow one for the company. Only five of its twelve parks are even open during the winter months. That's a big reason why SeaWorld continued to lose money in the quarter. So a truer test for SeaWorld will be to see how the company does in the spring and summer, especially when kids are off from school and families take vacations. Interim CEO John Reilly expressed hope though. Reilly noted in the company's earnings release that SeaWorld, which also owns the Busch Gardens and Sesame Place theme parks, reported a 10% increase in season pass sales during the quarter. 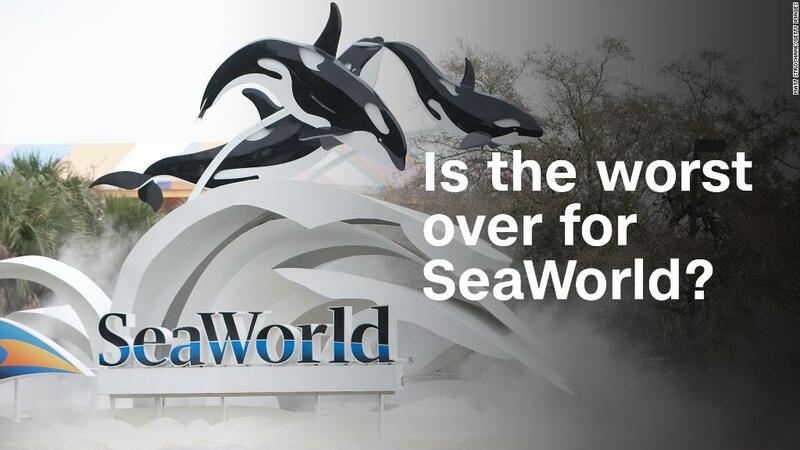 SeaWorld has struggled for the past few years after the "Blackfish" documentary aired in theaters and on CNN in 2013. "Blackfish" showed the unflattering way the company treated orcas, or killer whales, at many of its aquatic theme parks. The company has also been targeted relentlessly by animal rights group PETA. SeaWorld has tried to improve its corporate image. It announced in 2016 that it would stop breeding orcas in captivity and also end its orca shows at its San Diego theme park. They continue elsewhere though. The increased attendance is a positive sign after years of weak financial results. Former CEO Joel Manby stepped down in February after he failed to stop the slide in visitors. During a conference call with analysts Tuesday, Reilly stressed that SeaWorld is spending a lot of time on animal rescue and rehabilitation efforts -- and that SeaWorld needs to do a better job of making that a key part of its marketing strategy. Still, PETA says SeaWorld must do even more if it wants its turnaround to continue. "This financial fluke is a one-off unless the company not only continues to shift its focus to non-animal attractions, but also ends animal acts," said PETA executive vice president Tracy Reiman in a statement. And even though SeaWorld finally had some good news with its latest earnings, the stock is still down more than 35% since its initial public offering in 2013. SeaWorld used to be owned by Anheuser-Busch InBev (BUD) and was bought by private equity firm Blackstone (BX) in 2009, which led the IPO. Blackstone sold its stake in SeaWorld last year to Chinese real estate conglomerate Zhonghong Zhuoye Group. Reilly said during Tuesday's call that SeaWorld is working with Zhonghong on potential partnerships but that the company had nothing definitive to report just yet about opening any new SeaWorlds or other theme parks in China.